A program designed to encourage university faculty and teaching assistants (TAs) to use cooperative learning in undergraduate classrooms was evaluated through the perspectives of faculty, TAs and students. 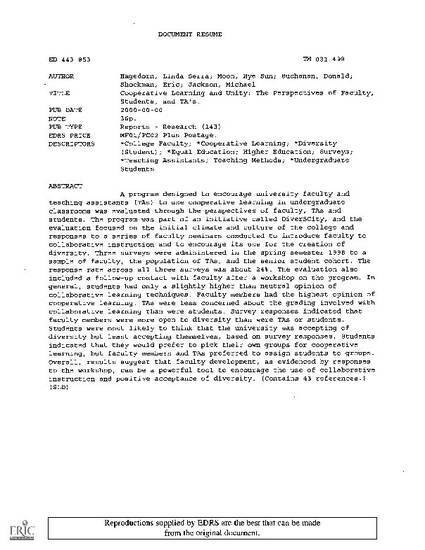 The program was part of an initiative called DiverSCity, and the evaluation focused on the initial climate and culture of the college and responses to a series of faculty seminars conducted to introduce faculty to collaborative instruction and to encourage its use for the creation of diversity. Three surveys were administered in the spring semester 1998 to a sample of faculty, the population of TAs, and the senior student cohort. The response rate across all three surveys was about 24%. The evaluation also included a follow-up contact with faculty after a workshop on the program. In general, students had only a slightly higher than neutral opinion of collaborative learning techniques. Faculty members had the highest opinion of cooperative learning. TAs were less concerned about the grading involved with collaborative learning than were students. Survey responses indicated that faculty members were more open to diversity than were TAs or students. Students were most likely to think that the university was accepting of diversity but least accepting themselves, based on survey responses. Students indicated that they would prefer to pick their own groups for cooperative learning, but faculty members and TAs preferred to assign students to groups. Overall, results suggest that faculty development, as evidenced by responses to the workshop, can be a powerful tool to encourage the use of collaborative instruction and positive acceptance of diversity.